Cast: Steven Pasquale, Reiko Aylesworth, John Ortiz, Johnny Lewis, Kristen Hager. Story: Aliens and Predators fight on Earth. Running Time: 1hr 26 minutes. It seems only yesterday that Alien vs Predator surprised us by being reasonably average - but it was actually four years ago. This one has its own share of surprises too. I have one major bone of contention which kept bugging me throughout, and that's the DARKNESS of it all. Most of the action takes place in various badly lit environments, so you can't see what's going on, even on the big screen. 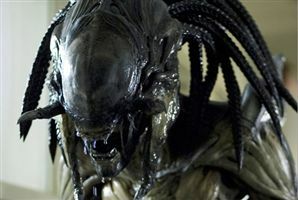 This is worsened by the fact that at the end of the last movie, an alien burst forth from a predator's belly, so we now have a PredAlien hybrid that has Daddy Pred's rasta-pigtails. This makes it virtually impossible to tell the bad guys apart when they're going at it, so you can't tell who's winning. More to the point, the creatures are so similar that I didn't even twig that one of them was a hybrid until after I'd got home and looked at the still pictures. On the upside though, the low light makes the effects look more convincing (much like Cloverfield's hand-held camera), but this is at the expense of being able to see what's going on, so the movie experience loses out as a whole. And, to be honest, both teams of freak do look an awful lot like men in suits. Which of course they are, but it's not supposed to be that obvious. On a more positive note, there is a dose of unpredictability that we don't normally see in splatter fodder like this. Yes, we have the college kids, the hard-nosed soft-centred Ripley-esque army woman and the local cop way out of his depth, and they do get picked off one by one, but it's usually a surprise when one of them goes. More than once I was shocked to see the character I expected to see the end credits get splurged all over the wall, and that earns it points in my book. The effects are well up to scratch, as you would expect from directors with a history in visual effects, and the story is largely irrelevant. Whereas the previous AvP successfully set up the scenario of Aliens and Predators locking tentacles, this one just goes with the splattering. AVPR: Aliens vs Predator Requiem is no better or worse than the previous episode, but with different strengths. It's never going to convert anyone, but as this type of movie goes, it's actually not bad. To enjoy this film you should: have a history of these movies. AVPR: Aliens vs Predator Requiem was released in the UK on 18th January 2008.